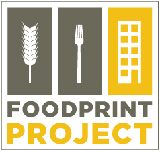 The Center for Urban Pedagogy has created an awesome new video that explores some of the economic and consumer forces that combine to create the South Bronx foodscape. 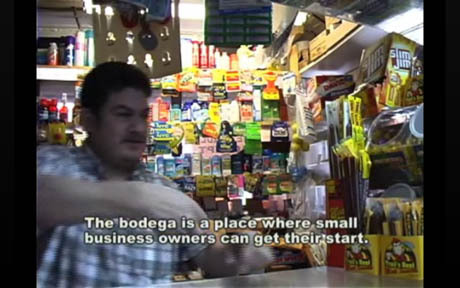 It’s called Bodega Down Bronx, and you can watch it in full (a half hour well spent) over over at Design Observer, where it premiered earlier this month. IMAGE: Milton Gil, Manager of Elliot Your Place Superette. Still from Bodega Down Bronx. With brief detours into fast food restaurants and a food co-op, the film mainly focuses on bodegas, the 24-hour convenience store/mini-marts that are on nearly every street corner in New York. 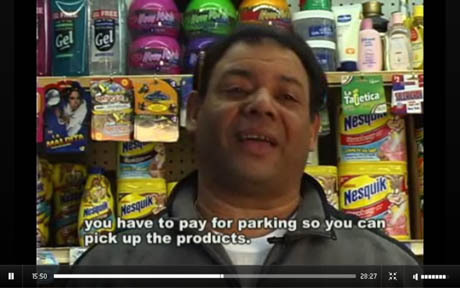 Among the many highlights is an interview with Stanley Fleishman, CEO of Jetro, a cash-and-carry wholesaler where bodega owners stock up on grocery items: his special promotion flyers could be directly responsible for fluctuations in the nutritional intake of South Bronx schoolchildren. Interestingly, although Fleishman is not in favour of government-sponsored healthy eating policies and he professes to only respond to, rather than create, demand, he does explain that it is in Jetro’s interest to create more demand for fresh fruit and vegetables among bodega customers: the more perishable produce the bodega owner stocks, the more often they have to return to Jetro. Fleishman also spends some time explaining the economic niche that bodegas fill: the big supermarkets, he says, want to make a sale of $70 to $80 per transaction, and that can’t happen when a customer is on foot or in a low-income neighbourhood – or both. IMAGE: José Manuel Céspedes, Manager of Manny’s Mini Market. Still from Bodega Down Bronx. The movie also visits Hunt’s Point Terminal Market, the largest fruit and vegetable market in the world by trade. According to Myra Gordon, the market’s CEO, every day enough produce passes through Hunt’s Point to feed 9% of the population of the United States. Not much of it makes its way to the bodegas, however: as several charmingly frank shop owners confirm, although the prices are actually lower at Terminal Market, Jetro’s free parking means they’d rather pick up supplies there. 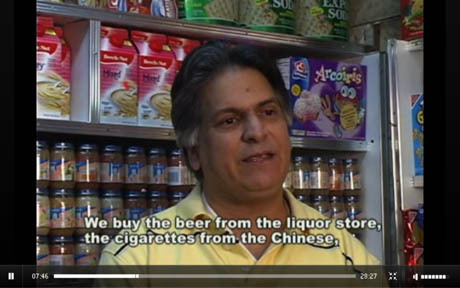 IMAGE: Bodega owner. Still from Bodega Down Bronx. Some products are delivered directly to the bodegas: Frank Falcon, a distributor for J&D snacks, is in charge of crisps, pretzels, pork scratchings, nuts, party mix, corn puffs, and the like. 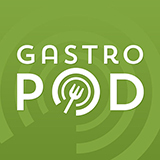 His products are so popular in the bodegas, he notes, because they’re priced at 99c or less, which means that kids – who make up a large proportion of the bodega consumer demographic – can afford them. IMAGE: Franz Falcon, J&D Snacks. Still from Bodega Down Bronx. The video was made as part of the Center for Urban Pedagogy’s awesome Urban Investigations program, which “asks basic questions about how the city works, and answers them over the course of a semester.” CUP staff collaborate with artists and high school students on each investigation: Bodega Down Bronx was created by CUP teaching artist and filmmaker Jonathan Bogarín and students from New Settlement’s Bronx Helpers, working with the CUP’s Valeria Mogilevich, Rosten Woo, and intern Sarah Nelson Wright.